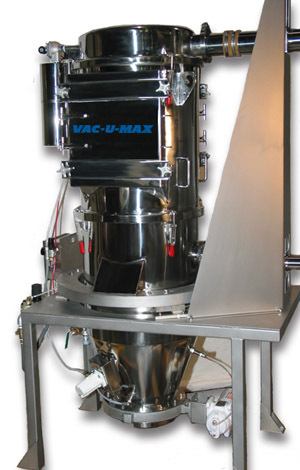 July 29, 2016 - "Press Releases"
The VAC-U-MAX Batch-Weigh Vacuum Receiver is designed for multi-ingredient handling systems where cross contamination of ingredients is a concern. Multiple ingredients can be conveyed and weighed for accurate batching of ingredients on a systematic basis. Receiver is designed with four individual inlets with pinch valve closures. Pinch valves are controlled via a VAC-U-MAX batch-weigh control panel with solenoid junction box. Vacuum receiver cover design incorporates a hand wheel, allowing the cover to lift off easily for access to filters for easy cleaning. Other features include bolted construction, pulse filter cleaning, and an offset cone for complete discharge of ingredients. Vacuum sources include Venturi power units, regenerative blower packages, and positive displacement pump packages. For more information on VAC-U-MAX food ingredient handling systems please visit www.vac-u-max.com or call 800-VAC-U-MAX (800-822-8629).